A writer at Thrillist weighed in with his opinion for the 25 best Halloween candies, and here they are. Of course everyone is entitled to their opinion, and while I’m 100% in agreement with his choice for #1, Butterfinger, Payday and Heath have no business being on this list. What about the bottom 25? Those will be coming in the next post, and I’m very upset that one of my favorites is on it. Maybe I’ll do my own damn list. Oh and by the way, where I work they’ve got a whole section of “healthy” Halloween snacks this year. I don’t trick or treat any more, but if you’re giving out cauliflower snacks or chia crisps, I’m pretty sure your house is going to be egged, and I doubt they’ll be organic eggs. Stick with the candy. Halloween candy comes in all shapes and sizes, from new takes on old-school favorites to wax lips and, if your neighbors are sadists, pennies. 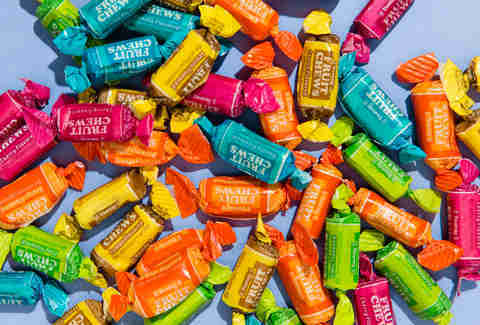 But when grown adults dressed as dancing hot dogs reminisce about their trick-or-treat outings of yore, they’re likely getting wistful for one of these 25 hall-of-fame Halloween candies, which we’ve ranked from great to greatest. One thing that’s always been vexing about the old Mounds/Almond Joy commercial jingle is that it creates the very confusion it presumes to clear up — namely, that people might be having trouble identifying which of two candy bars named Mounds and Almond Joy has nuts. 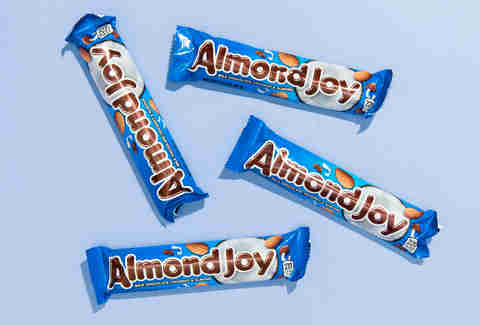 Obviously Almond Joy’s got nuts! Anyway, Mounds, a mess of coconut surrounded by dark chocolate, definitely does not have nuts. Don’t make that mistake. Sometimes you feel like a nut, and when you do, definitely do not purchase a Mounds. 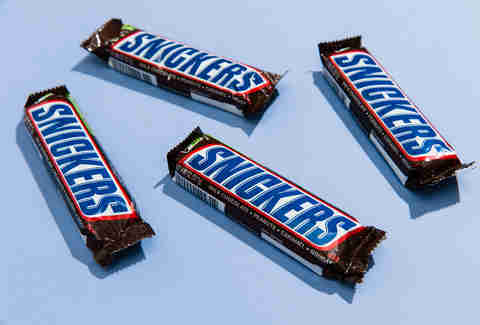 Nobody ever requests a Milky Way, and typically these candy bars fight it out for bottom-of-the-bag dominance with 3 Musketeers (which you’ll definitely not see on this list) and hateful pennies. Like Caramello on a budget, Milky Ways are perfectly serviceable, and provide the sugar blast you need. Side note: Why doesn’t anyone ever hand out Caramellos? Some extremely artificial fruit flavoring, a sore jaw, and a couple of wrapper jokesthat you feel embarrassed chuckling at (and that you suspect Dave Coulier either wrote or stole)? Bring it. 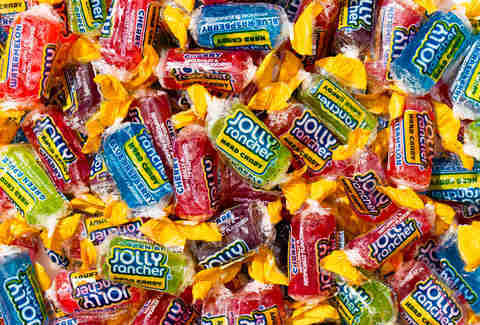 If you got the long, rectangular, flat Jolly Ranchers all the time, these would rank way, way higher. As it were, you usually get a couple of the cylindrical ones, and they’ve generally either shed part of their wrapper or had it meld to the candy, leading me to believe that people who hand out Jolly Ranchers for Halloween keep them under a heat lamp beforehand just to be evil. Nerds are basically little sugar boogers with a slight hint of fruit flavor but they sadly don’t come in flavor combo packs at Halloween. Dump random flavors in your mouth and hope for the best. Skittles would be way higher on this list if I could forget that time I put a whole bag in my mouth and cut the insides of my cheeks on all the sugar shrapnel that exploded everywhere. On the other hand, getting Skittles directly into your bloodstream is kind of amazing. Are PayDays kind of a grandpa candy? Yeah. Are they an underrated explosion of salty peanuts nougat, and caramel? Absolutely. Maybe grandpa was onto something. Or maybe this is why he lost his teeth prematurely. Either way: underrated. 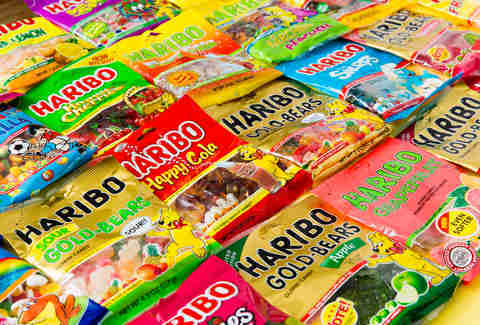 There are more than two dozen variations on Haribo Gummies, but you’re probably not getting Dinosaurs or Frogs or whatever. You’re getting the Gold Bears. Which is cool, but there just aren’t enough in a fun-sized bag to make you forget about the wonders of Twin Snakes or Happy Cola. A delicious reminder that your candy tastes are as outdated as your Soup Nazi costume. If they were embedded in a cookie or something, they might be No. 1, but M&Ms are still pretty great on their own. Especially if they’re the peanut kind. Or the peanut butter kind. Or the pretzel kind… actually, why don’t they make a little bag with all the different flavors inside? That would put it in contention for the top five. Take heed, Mars. 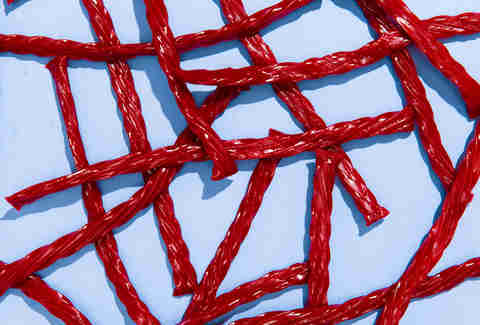 The Swiss army knife of candy, Twizzlers are not only delicious in their artificial strawberry glory, are also an excellent solution to drinking in a post-plastic straw era. They’re also excellent whips and work as ropes. MacGyver didn’t invent these. But at one point, I’m pretty sure he used them to siphon gas and suture a wound. But not in that order. Basically PayDays, but covered in chocolate and paired with the crushing disappointment you feel when the kids don’t understand your incessant Goonies references. But hey, keep trying. Nerd. Another in the pantheon of candy-based chemistry, Starbursts come in so many flavors, the permutations among flavor combinations are almost endless. Until you get a little pack with two lemons in it — a cruel twist of fate that happens all too often. The Heath bar makes you feel like a little British schoolboy with its toffee butteriness, and will make you look like one when your teeth eventually fall out from all the toffee you have lodged in your molars for weeks on end. It’s a small price to pay for a brittle little piece of perfection. Go ahead and call this a garbage take, preferably while pelting me with these, the absolute most underrated treat in the bag. These things seem to only exist during Halloween or in your grandma’s candy dish but, damn it, they offer the chance to do some great alchemy. Pop a vanilla and an orange in your mouth? Creamsicle. A lemon and a lime? Sprite candy. Eat them all at once? You’re a crazy person. We should hang out. The American classic is the best melt-in-your-mouth, no-frills candy in the bag. Toss in some almonds and you’ve got a beast. Toss in Cookies ‘n’ Creme and you’ll wonder what the hell you’re even eating. 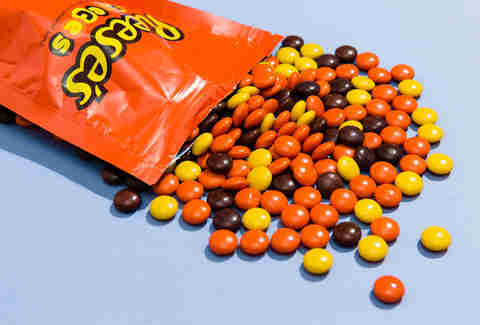 They have the same shape and same coating as M&M’s, but only one has built-in peanut butter. You no longer have to wonder what it would be like if they stuffed these in a Peanut Butter Cup, but that shouldn’t stop you from making a DIY version. The snack so delicious that simply calling it Goodbar seemed like a sign of disrespect, Mr. is the king of the Hershey’s variety pack — a simple, peanutty bit of awesome that puts Krackel — Nestlé Crunch’s less-refined cousin — to shame. Finally something healthy. Rice puffs are healthy, right? Especially when they’re covered with Nestlé’s deliciously melty milk chocolate. If you let one sit in your mouth unchewed for long enough, it dissolves into a poor man’s Cocoa Krispies. It’s like somebody took a bunch of peanut butter, transformed it into the world’s thinnest toffee, and layered it underneath a blanket of chocolate. And when you bite it, the little flakes pop off and melt on your tongue like butter produced by a chocolate cow. It’s the closest your Halloween bag’s gonna come to having a sandwich inside, and let’s be honest: milk chocolate and sugary wafers are way better than a tiny tuna on rye, especially after they’ve been sitting in a pillowcase for a few hours. 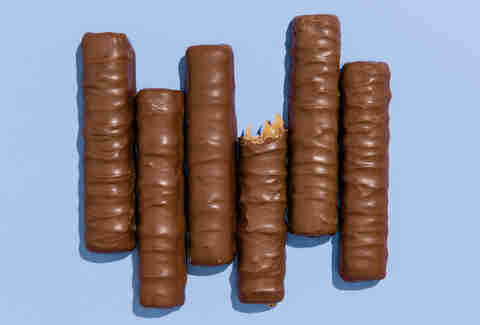 Plus, the two-by-two snack-size KitKat acts as an adorable accessory for your Hacksaw Jim Duggan costume. It’s easily the heartiest of all candy bars: nougat, caramel, nuts, and chocolate represent pretty much every food group. 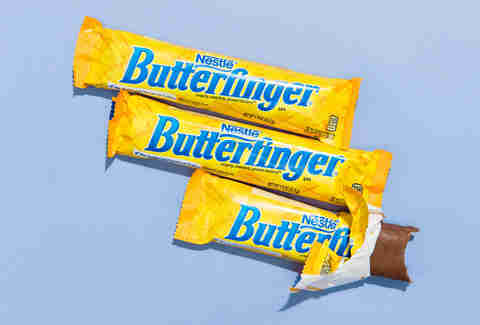 And this is one that’s hard to eat in a single bite, even when you’re going bite-size. It’s worth the effort nevertheless, and makes for a solid accessory for your Pissed-Off Betty White costume. The cookie crunch. The deliciously hard caramel. The ultra-silky chocolate. There are a lot of things to love about Twix (three, actually), but this thing’s even better in fun-size form. The ratios between the three main components are simply perfect, striking a balance that makes a lifetime insulin prescription totally worth it. Not only is it the greatest candy out there, it’s also one of the greatest snacks, period, the perfect alchemy of peanut butter and chocolate. And it’s so, so versatile… especially at Halloween. Are you devouring the mini, with its jagged chocolate edges? The medium-cup, in all its one-biteable glory? Or the pumpkin, which serves as a vessel to get as much sugary peanut butter in your mouth as possible? 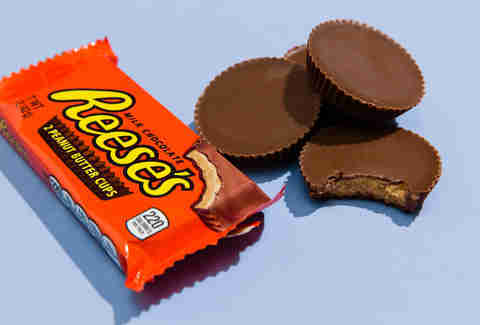 It’s your lucky day: there’s no way to go wrong eating a Reese’s.